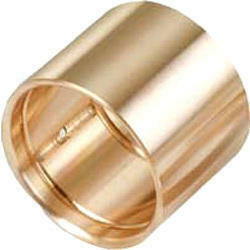 We are an acclaimed entity, engaged in offering a wide range of Bronze Bush. Being a quality-oriented firm, we promise our clients that this bush is best in quality and durability. Our deft professionals only use fine quality bronze, while manufacturing the entire array. Moreover, our offered bush can be availed in a wide range of sizes and shapes, as per the needs of our esteemed clients. Incepted in the year 1995, at Vadodara (Gujarat, India), we "Shreeji Cast Alloys" are a famous manufacturer and supplier of a comprehensive range of Pump Casting, Aluminium Casting, Brass Casting, Gun Metal Casting, Metal Casting, Bronze Casting Parts, etc. Manufactured by making use of the best quality raw material and advanced machines, the offered components are manufactured in strict adherence with the norms and policies set by the regulatory bodies. The components provided by us are highly applauded among our patrons for their remarkable attributes such as easy installation, precise dimensions, flawless finish, rust proof, application specific design, sturdy construction, flawless finish, optimum strength and corrosion resistance. Moreover, our offered components are provided in different dimensions and other related specifications to meet precise requirements and necessities of our renowned customers at rock bottom prices.